Commission for Agricultural Costs and Prices (CACP), in its Kharif Crops report has shown that the average Punjab farmer uses as much as 5,337 litres of water from irrigation to produce one kg of rice. Prime Minister Narendra Modi, on Sunday, said India needs a “second” Green Revolution. But unlike the “first” one that was centred in North-West India — basically Punjab, Haryana and western Uttar Pradesh — the cradle of the next Green Revolution will have to be Eastern India, covering east UP, Bihar, Jharkhand, Odisha, West Bengal and Assam. The main reason for this — although Modi did not specifically allude to it — is water availability. The Commission for Agricultural Costs and Prices (CACP), in its latest Price Policy for Kharif Crops report for 2015-16, has shown that the average Punjab farmer uses as much as 5,337 litres of water from irrigation to produce one kg of rice. 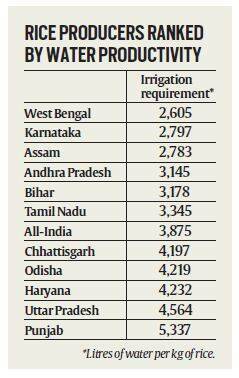 As opposed to this, the irrigation requirement is just 2,605 litres for every kg of rice in West Bengal. Paddy farmers in Assam, Bihar and Odisha — besides Karnataka and Andhra Pradesh — are also more water-efficient relative to their Punjab and Haryana counterparts (see chart). Much of this has to do with policies that encourage inefficiency in domestic resource use. Paddy yields in Punjab, at 5.8 tonnes per hectare, may be higher than the 4.1 tonnes for West Bengal or the all-India average of 3.6 tonnes. But the most efficient state in terms of land productivity isn’t necessarily the most efficient with regard to use of the other important factor of production: water. Punjab receives hardly 40 per cent of the monsoon rainfall that West Bengal, Bihar or Odisha get and just over a quarter of Assam’s seasonal average. Yet its farmers grow paddy. And they do mainly by drawing groundwater, that too during the summer months when evaporation rates are high as well. “Rice as a crop is clearly not suited for Punjab. The state, in fact, used to traditionally grow makka (maize) and sarson (mustard), which it no longer does. Today, given the increasing scarcity of water and depleting of aquifers, the focus has to be more crop not just per acre of land, but also per drop of water,” says Ashok Vishandas, chairman, CACP. That would mean promoting rice cultivation more in states (read, eastern India) where water is relatively abundant. The CACP report has recommended metering of electricity and water used in irrigation alongside fixing of quantitative ceilings on a per-hectare basis. Farmers who use less water/electricity than the prescribed ceilings may be rewarded through cash incentives equivalent to the unused units valued at the appropriate market rates. This would encourage farmers to go in for drip irrigation, direct-seeded rice production and other such practices, leading to improved water use efficiency in agriculture.